Mix all ingredients together in large bowl, stir to combine. Fill small baggies with dry mix. Package for gift: Fill a decorative tin with one cocoa mix baggie. Attach gift tag instructions with a small box of chocolate mini cups. add boiling water and stir. For richer chocolate, add warm milk. Top with mini chocolate cups filled with mini marshmallows or dollop of whipped cream. 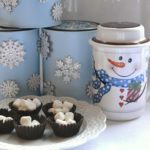 Package the cocoa mix in a cute tin or glass jar. Recipe for Chocolate Mini Cups-Dessert Category.